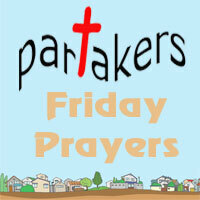 G'day and welcome to Partakers Friday Prayers on the 7th of October, 2011. 5. Prayers for individuals: Pete, Jane, Joy, Ruth, Doug, Denise, Sandra, Sarah, Nicola and Kathy.